studying session. However, it is also possible that Tommy, to some degree or another successfully deceived Dr. Lesse. Lesse does not include any quotes from Tommy's testimony under sodium amytal, nor does he explain what exactly Tommy's "attitudes and emotions" were. Moreover, he seems inexplicably willing to overlook the obvious when it comes to evaluating Tommy's behavior. The test was performed in the patient's room. As the needle was inserted, he became extremely apprehensive once again, began to whimper and at times cried openly. "Please take it out, please take it out!" he held his body rigid and had to be reassured that nothing would go amiss. Dr. Lesse does not consider the possibility that Tommy's strong reaction to the test was not only fear of needles, but a fear of being exposed as a liar. Since we now know Tommy was, at the time, being untruthful, he had an understandable motive for fearing how the sodium amytal would effect him in this regard. 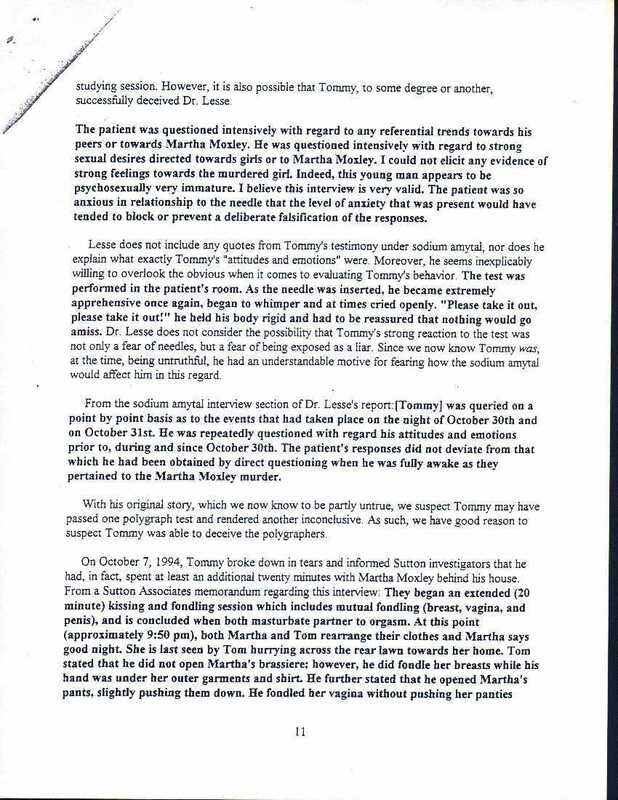 From the sodium amytal interview section of Dr. Lesses's report: [Tommy] was queried on a point by point basis as to the events that had taken place on the night of October 30th and on October 31st. He was repeatedly questioned with regard [^] his attitudes and emotions prior to, during and since October 30th. The patient's response did not deviate from that which he [sic] had been obtained by direct questioning when he was fully awake as they pertained to the Martha Moxley murder. With his original story, which we now know to be partly untrue, we suspect Tommy may have passed one polygraph test and rendered another inconclusive. As such, we have good reason to suspect Tommy was able to deceive the polygraphers.